Frank Lloyd Wright designed church is worth visiting. Annunciation Greek Orthodox Church. Photo by Laura Thompson. 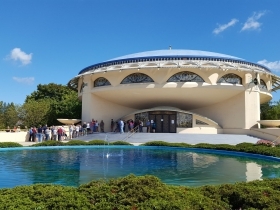 Annunciation Greek Orthodox Church is a structure unlike any other in the area. 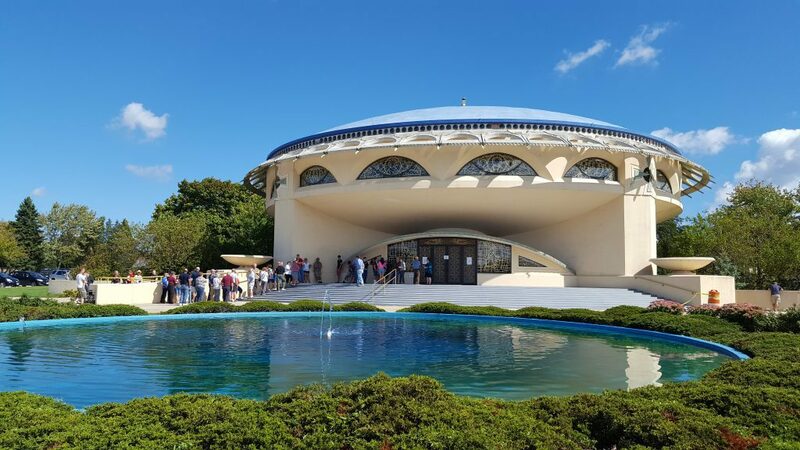 Located just across the Milwaukee border in Wauwatosa at 9400 W. Congress St., it is the hub of the Greek Orthodox community in Milwaukee. Designed by architect Frank Lloyd Wright, the church is one of the prolific architect’s last works. 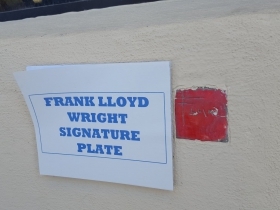 Wright began design work on the building in 1956 and the building ultimately opened in 1961, not long after Wright’s passing in 1959. Greeks first moved moved to Milwaukee in the early 1900s because of the wide variety of industrial jobs available, most notably in tanneries and on the railroads. Those who saved enough began to open their own restaurants, shops, and other businesses, often sending money back to their families in Greece. While many early immigrants were bachelors who returned to Greece, gradually, a more permanent Greek community began to form in Milwaukee. 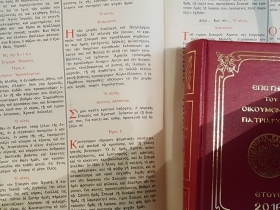 They formed the Milwaukee Hellenic Community – one of the first ten Greek Orthodox parishes in the US. After years of meeting in each other’s homes to worship, the group erected a church at N. Broadway and E. Knapp St. in 1914. After several decades, the parish outgrew the original church building, and the community commissioned Wright to build them a new church in 1955. To gain inspiration for the project, Wright traveled in Istanbul and visited the famed Hagia Sophia, which was built as an Orthodox church in the 500s and transformed into a mosque in the 1400s (with the Ottoman conquest of Constantinople), and then converted into a museum in 1935 by the Turkish government. The most obvious influence of the Hagia Sophia can perhaps be seen in the design of the imposing dome (45 feet high and 145 feet in diameter) which covers Annunciation, which is a symbol of both the heavenly abode, and of the idea that God is among us. Further Byzantine influence can be seen in Wright’s blue and white color palate. 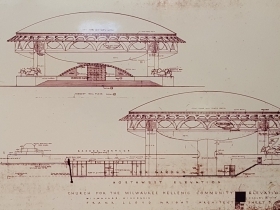 The Annunciation dome itself is an architectural marvel, supported by steel rods between ball plates that rest on bearings that expand and contract with Milwaukee’s extreme weather changes. Through his research, Wright learned about the three basic shapes for orthodox churches: a ship (representing the ship of life), a circle (representing eternity), and the equilateral cross (the standard cross of Orthodox churches). Though the building appears circular from the outside, long-time member John Krenitsky says that Wright actually chose the equilateral cross for the floor plan. Inside, the church is divided into three distinct areas: the narthex or vestibule, which is the connection between the church and the outside world, the nave, which is where services take place and parishioners sit, and the sanctuary or alter, which is located behind an icon screen and is usually only accessible to priests and bishops within the church. When I entered the church, I was surprised at how intimate the nave felt, even though this building is said to be much larger than the church it replaced. According to Krenitsky, that cosiness is by design, because one of the ideals of orthodox architecture was to make people feel closer to God. This central part of the church is called the soleia, and has only about 200 seats on a sloping ground floor. However, balconies encircling the soleia provide room for about 800 more parishioners, as well as for two antiphonal choirs, which traditionally sang a cappella. 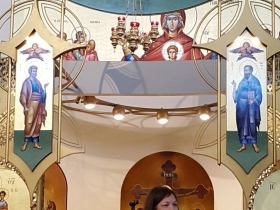 Almost everything within the church is imbued with symbolism. 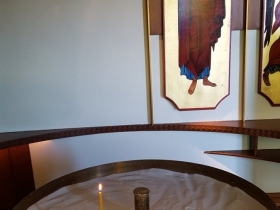 Candles in sandboxes in the entrance are symbols of Christ as the light of the world, chandeliers that start from the floor cause parishioners to look up toward the heavens, and icon screens represent stories from the life of the church. Frank Lloyd Wright passed away a few months before the church was finished, and so the Wright Foundation decided to match several pieces of art around the church to the Byzantine windows that already been installed. At long last, the Church opened its doors in July of 1961. Congratulations on finally taking an indoor photo on one of your architecture features.